The LD-100-RS-SS uses a peel and present design with the latest opto-electronic technology to dispense individual labels. The set-up is very easy. 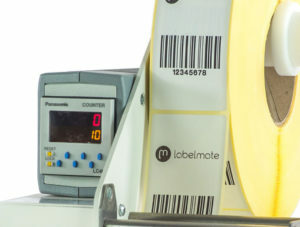 In less than 30 seconds, there is just one simple adjustment for label lenght. A special reflective sensor sits below the label and reliably senses the leading edge of you label. As the operator picks up a label, the next one is automatically and instantly advanced. 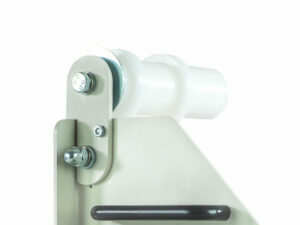 The label dispenser are equipped with 38mm core holders that accept all cores from 40 to 76mm. 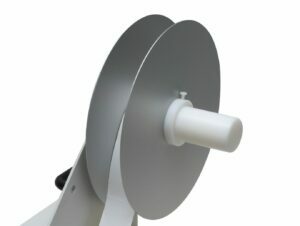 External roll diameter is 220mm (265mm with AWB option and 300 with LD-DE option). The LD-100-RS-SS features a stainless steel chassis and cover, to be used in humid environment. Ideal for food & beverage or pharamaceutical market. Designed for all-day, everey-day use, the LD-100-RS-SS is backed by LABELMATE’s famous 3-YEAR PARTS and LABOUR LIMITED WARRANTY (1-Year on power supplies), assuring you trouble-free performance. Will stop the dispenser after a pre-set quantity is reached. Factory installed. Inner & outer flange (per pair, not compatible with AWB-option). Recommended for narrow labels. 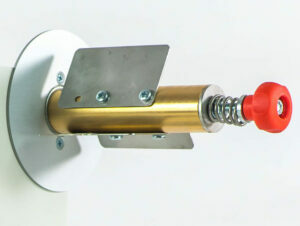 Adjustable Wearless Brake that allows to vary the roll tension and finetune the label peel-off position. 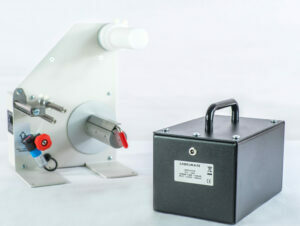 Create a mobile packing station by adding this battery pack to your dispenser. Operates +/- 8H. Complete set including charger and cables.